Remembrance Day Photo Collage – Round Up! Over the last two weeks I have shared fourteen photographs, one each day of someone who I thought should be acknowledged for the contribution they made in respect of King (and Queen) and Country. We started out at the beginning with these two collage pictures, which I have merged into one collage – a collage within a collage! I hope you enjoyed the individual posts. I am in the midst of planning and structuring my posts for 2014, given that we commemorate the beginning of the War to end all Wars. This entry was posted in Uncategorized and tagged Genealogy, Remembrance Day Photo Collage Festival. Bookmark the permalink. 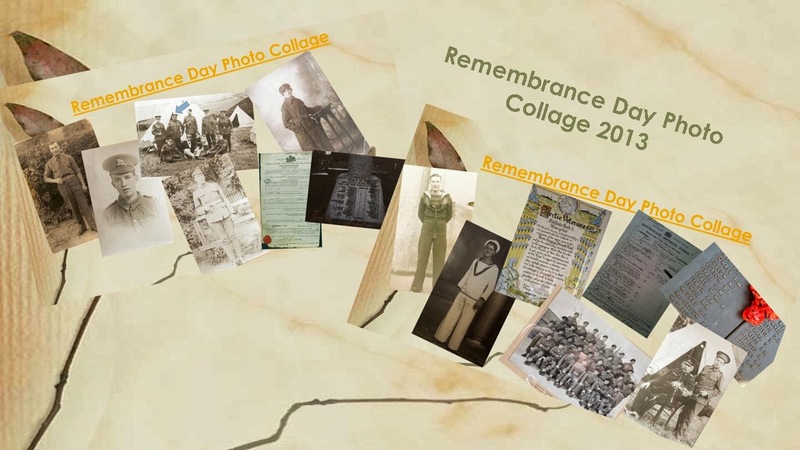 2 Responses to Remembrance Day Photo Collage – Round Up! Thank you, Julie, for introducing us to this challenge. I found it a moving experience to write about my ancestors who served and died in war. . . I wish it had ended all wars. Congratulations on completing a magnificent remembrance of your people.